The Best Concert Photography blogs from thousands of top Concert Photography blogs in our index using search and social metrics. Data will be refreshed once a week. Carolinas, UK, East Coast, About Blog Shutter 16 Magazine is the collaboration of many enthusiastic and dedicated music journalists with a passion for the lens or written word. Facebook fans 6,364. Twitter followers 9,327. Facebook fans 2,928. Twitter followers 750. Phoenix, AZ About Blog Official blog of photographer Joseph Berg. Specializing in portraits, lifestyle, travel and music photography. Phoenix based with a bag always packed. 5. A Music Blog, Yea? Toronto, ON About Blog I’m Alicia — creator and owner of A Music Blog, Yea?. I’m 22 and live in Toronto, Ontario. On the music front, I absolutely love going to/photographing concerts and interviewing my favourite people. It’s amazing to have a job that allows me to speak with not only musicians I love, but also wrestlers. Facebook fans 11,825. Twitter followers 31,712. Toronto, ON About Blog Aesthetic Magazine produce a variety of content including album and concert reviews, compelling interviews, and more. Facebook fans 3,505. Twitter followers 8,580. Denver, Colorado About Blog Greeblehaus is a Denver lifestyle blog by Aimee Giese covering parenting, music, concert photography, travel and tech. Blog since 2005, Denver since 1994. Facebook fans 9,212. Twitter followers 28,543. Auckland, NZ About Blog Ambient Light is your go to place for New Zealand based live music news, reviews and interviews, featuring some of the best concert photography you'll find worldwide. Facebook fans 3,587. Twitter followers 290. Facebook fans 3,809. Twitter followers 11. Birmingham, AL About Blog Concert photography and cultural photography based in Birmingham, Alabama. Facebook fans n/a. Twitter followers 1,006. Palo Alto, CA About Blog Paige K. Parsons is an award-winning live concert photographer based in San Francisco and specializing in live music photography and band portraits. Facebook fans 2,068. Twitter followers 661. Kansas City, Missouri About Blog Live '80s Kansas City concert blog with reviews of concerts in Kansas City and live events featuring artists from the 1980s performing in the area. Facebook fans 7,330. Twitter followers 357. La Mesa, California, United States About Blog Where music lives and breathes. Music Mavericks Blogazine strives to bring out honest emotions and spirit in our images. What is real is more extraordinary than any processing techniques, although we can do both. Let us share, inform and keep you posted about various artists, and tours of all genres. Facebook fans 506. Twitter followers n/a. Edmonton, Alberta About Blog Music enthusiast and photo-fanatic! Snapping compelling musician portraits from smoky pubs to sold out arenas, capturing the life of rock 'n roll is second nature to me. Photographing out of Edmonton, Alberta, Canada, I specialize in portraits of live band performances, and promotional images for local and international touring musicians of all kinds. Facebook fans 3,145. Twitter followers 602. 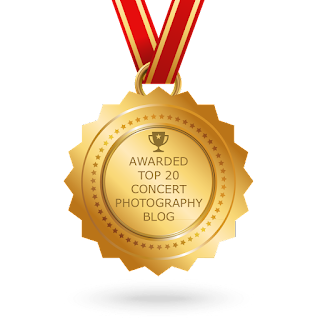 CONGRATULATIONS to every blogger that has made this Top Concert Photography Blogs list! This is the most comprehensive list of best Concert Photography blogs on the internet and I’m honoured to have you as part of this! I personally give you a high-five and want to thank you for your contribution to this world.